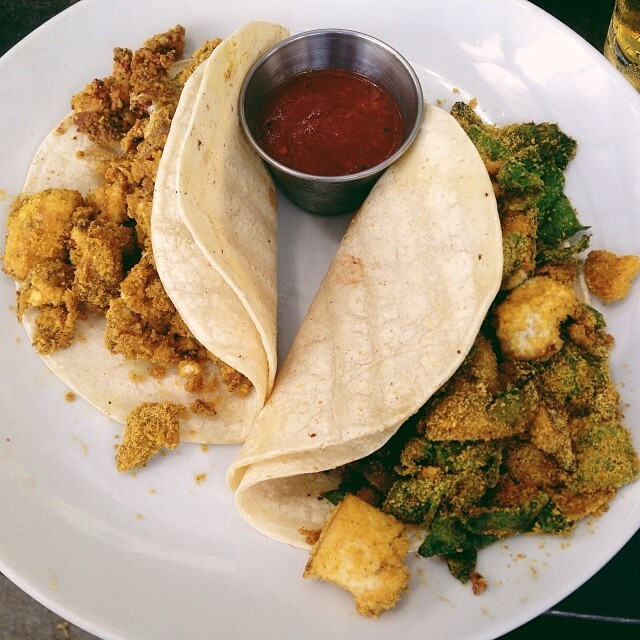 In years past I’ve said the rennedict or the tofu scramble/omelet are my favorite thing at Bouldin and while that’s often true it’s more true that I love the breakfast tacos. I never go long without eating the “Ren”, Tofu scrambler sautéed with jalapenos, garlic and onion and the “Neil”, Tofu scrambler, sautéed mushrooms, and spinach on corn. It’s my first meal when I come home after a long trip and what I get when I am so hungry I can’t think. On a craveability scale of 1 to 10 I’d give them a thousand. 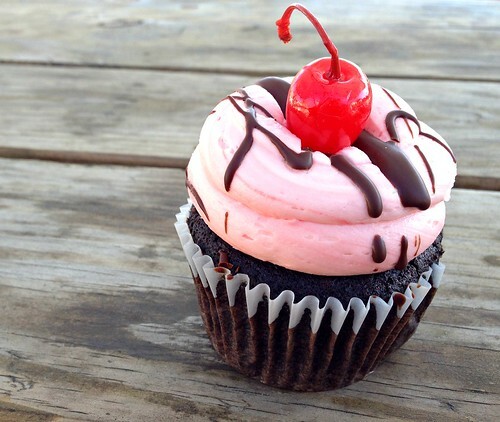 The truth is, I never really cared about cupcakes until I tried the ones from Capital City Bakery. Theirs are so light and airy and missing any cloying sweetness you get from other bakeries. These cupcakes are the best form of vegan activism there is because once a person realizes that vegan cupcakes are better, well, it can open their mind. I get the brownies all the time too and they are the perfect sweet treat for me, chocolate mixed with chocolate chips. Here’s a protip, that sucker will feed you for a week if you divide it up. And the ham and cheese kolaches are the kind of food that I never would have imagined I’d still get to eat vegan. Have it warmed up, though. It’s so good. 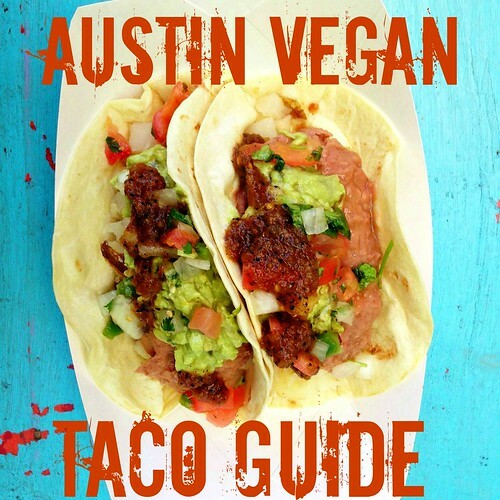 Since you can’t always get the Vegan Nom’s barbequed brisket with jalapeno mac and cheese taco I will happily put the Migas Taco on this list. 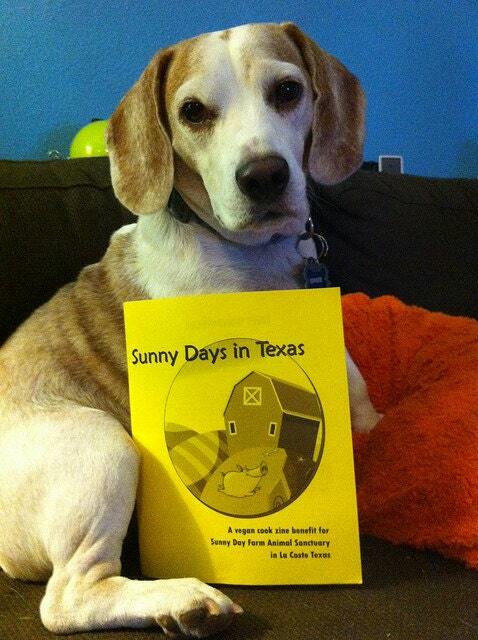 It’s perfect for mornings when you’ve had too much fun the night before or if you are having a bad day and want to change that. I love their simple tofu scramble and mixed with roasted peppers, tortilla chips, cheddar, and a chipotle sauce it is even better. On the right is the maple miso sweet potato taco which is a close second in favorites. Everything they serve up is awesome. 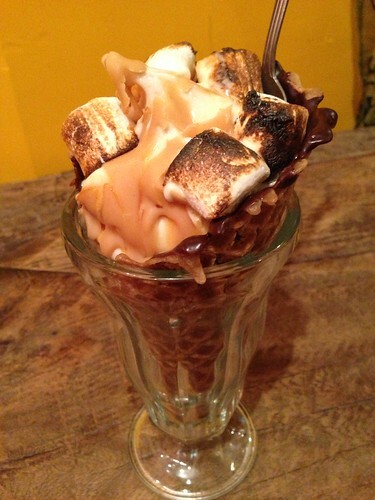 On any given day Sweet Ritual Ice Cream Parlor has 17 different artisanal flavors. The specials like “Death Metal By Chocolate”, the “Peach Brown Betty” or the “Lady Pleaser (chocolate covered potato ships with smoked sea salt” will slay you with deliciousness but if you put that ice cream inside their homemade, chocolate dipped cone and then cover it with toppings like toasted marshmallows and peanut butter magic shell you will understand the meaning of life. It’s to eat ice cream. And they have different varieties from hemp to coconut and GF cones so I promise there is something for everyone. 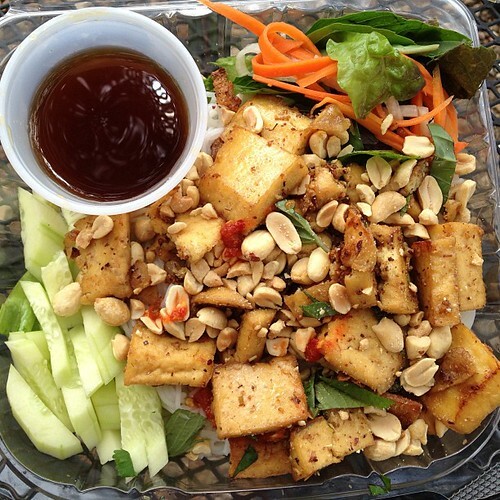 I’ve probably had Vietnamese Bun over a hundred times and the one from Lulu B’s is my favorite, I don’t know if it’s their chewy lemongrass tofu, the always super fresh vegetables, the mint and basil, the wonderfully excessive amount of peanuts, the sweet spicy sauce that everything is drenched in or just the perfect combination of all of the above but it’s the best version there is. They moved to a little restaurant on South Congress but it’s still cash only so beware! If there was ever going to be a pizza that I would refer to as “The Love of My Life” this would be the one. 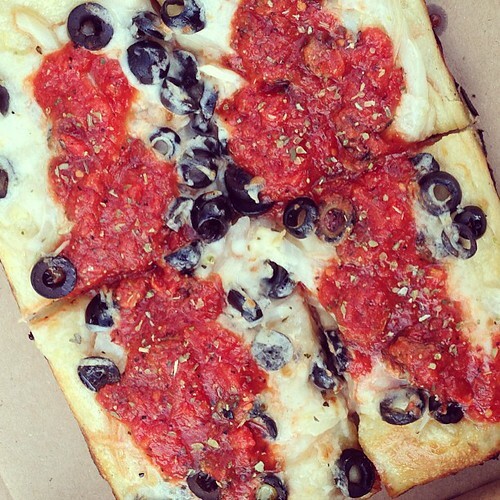 VIA 313’s Detroit style pizza is truly something to get obsessed about. Their pizzas are baked in individual oiled steel pans that make the crusts taste almost deep fried on the bottom. The Follow Your Heart brand vegan cheese is cooked right on top of the crust which works much better on a vegan pie. You pick your toppings and the sauce goes on top and tastes fresh and herby. I love that they don’t skimp on my olives. They have a couple of locations, one at Craft Pride on Rainy Street which is fun because the only serve Texas craft beer and one on East 6th outside of The Violet Crown Social Club but soon, like really soon, they are opening a full on restaurant in Oak Hill. I can’t wait. I honestly don’t think I’ve had a better smoothie in my life than the ones at Juiceland. 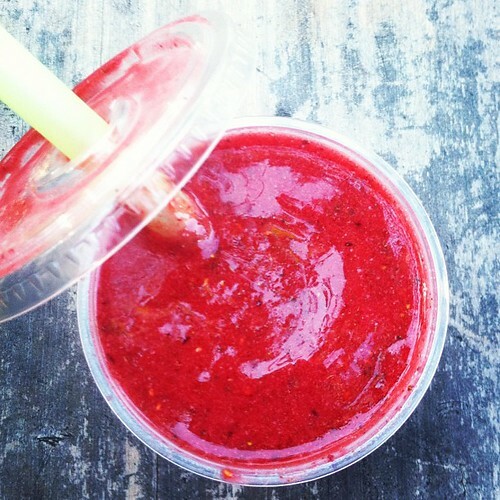 Pictured above is “The Love Below” which has Cherries, Raspberries, Strawberries, Cacao, Coconut Oil, and Rice Milk. But I love the Originator just as much. Maybe it’s the Fresh Apple Juice but it also has Bananas, Blueberries, Cherries, Peanut Butter, Brown Rice Protein, Spirulina, and Flax Oil. I’ve tried to make these suckers at home but it’s just not the same. And their salads are off the hook too! It’s my summer ritual to go swimming at Barton Springs and then get a smoothie and a Double Rainbow Salad or the Quinoa Ranchero Bowl. The perfect meal when it’s 5,000 degrees out. And here’s a protip, they sell some of their juices by the gallon to make cocktails out of! The Kale Cucumber Margarita is the best thing ever to take with you on a river trip with a bottle of vodka, so healthy! 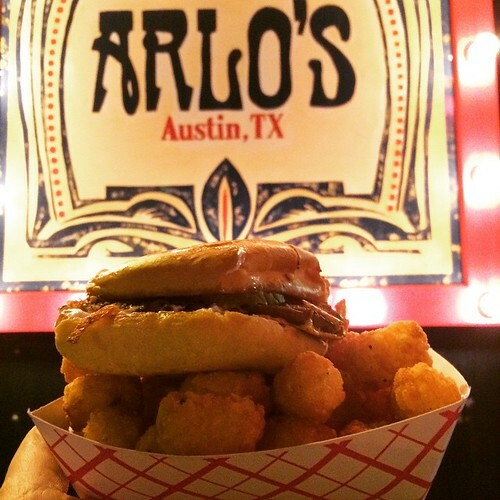 I often say that the one thing I’ve ever seen all Austin vegans agree on it’s the love of the Arlo’s Bac’n Cheeze Burger. Now that I’ve written it down someone is sure to disagree but most of us adore their handmade lentil based patties topped with cheddar daiya and vegan bacon. For me it’s always a late night downtown meal but now that they are open for lunch and have opened a second location on South Lamar I will get even more Arlo’s in my life. 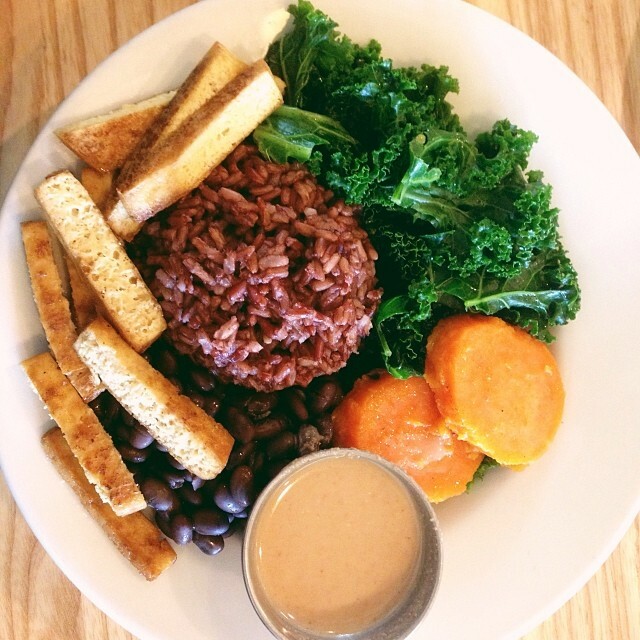 Lately Unity Vegan Kitchen, a trailer off Barton Springs Road, has been killing it with their weekly specials. 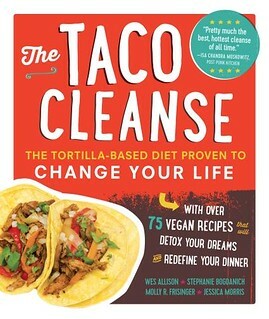 It’s always exactly the food I didn’t even know I wanted and then suddenly couldn’t live without. Last week it was breakfast mac and cheese, which was mac topped with tempeh bacon, tofu scramble, avocado, and all kinds of other good stuff. A few weeks ago it was chicken chimmichangas. And then she brings back the chicken and waffle special with white gravy. It’s all irresistable. I also love the muffaletta sandwich which is always on the menu, her homemade bread makes all the difference, and the quinoa spring rolls are light and yet filling enough for a while meal. Don’t miss it! I remember when I used to travel all the way up to the domain shopping center in the northiest section of North Austin to get a delicious bowl from The Steeping Room, so glad they opened one a bit more central on north lamar. I love that the beans, grains, and greens change all the time for variety at the Steeping Room. But, you can always get tofu, cashew sauce, peanut sauce, or even tamari which I’ve never tried because they have cashew sauce and peanut sauce. I also love their B.A.T. sandwich, tempeh bacon, tomato, and arugula with their hot soup like cream of mushroom. Of course the most fun part is picking out a tea from their 7,000 varieties and they always have dessert too! So that’s what are my personal favorites but their are a ton of other things that could have been on this list like the barbecued soy curls at BBQ Revolution, the corn tamales at Cool Beans, the AMAZING homemade Cheeze plates at Counter Culture, the Vegan Platter at Wasota African Cuisine, the Veggie Meshi and Beet Fries at the East Side King Brunch at Bistro Vonish or “elevated stoner cuisine” at the Golden Spike Rail Cart. The Green Curry at Sway or the pastries at Thai Fresh. 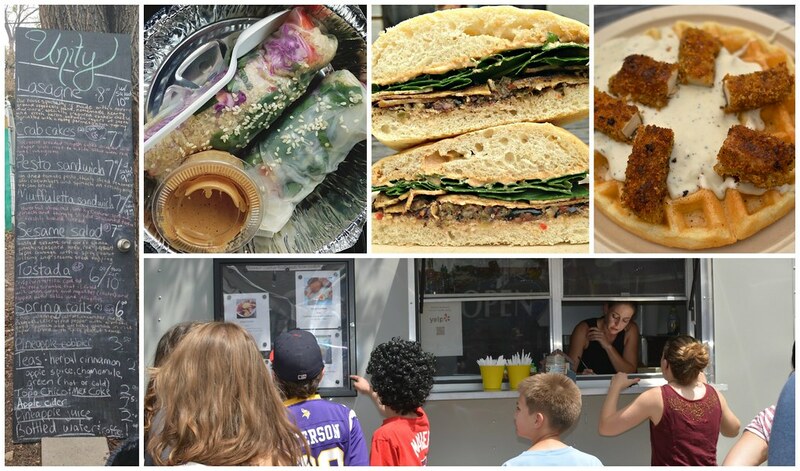 The sausage empanadas at the Fair Bean or the frozen bananas with toppings at Bananarchy the Freeto Burrito at The Vegan Yacht or the Tofu Po’Boy at Wheatsville or the Seitan Reuben at Schmaltz. The Mexican Pancake at Mr. Natural. 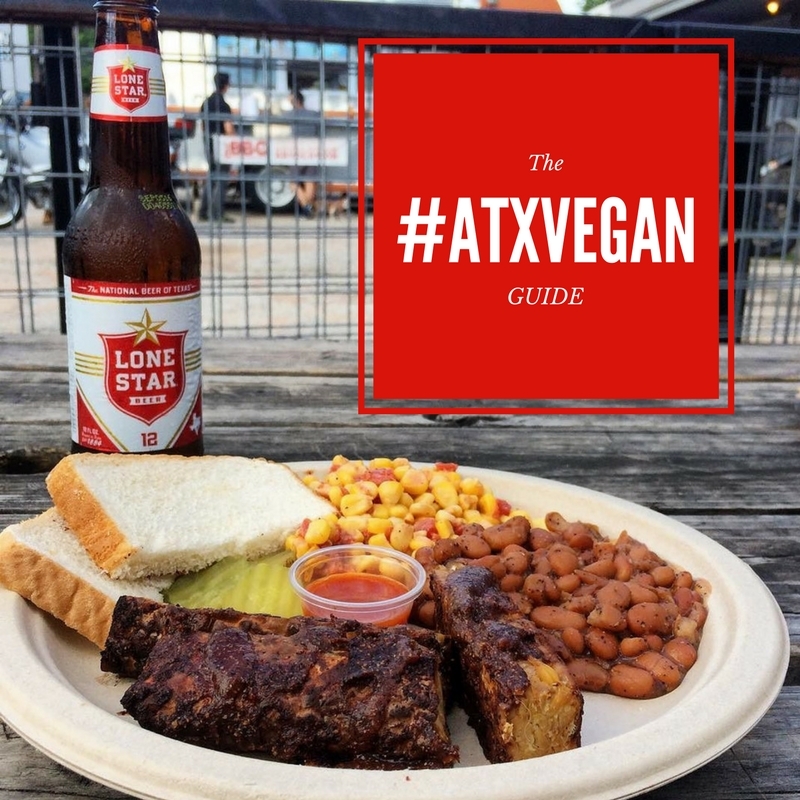 Vegan Jambalaya on a stick at Baton Creole or the breakfast tacos with shoestring potatoes at Cherrywood Coffeehouse or the Sunday night vegan ramen special at Ramen Tatsu-ya. 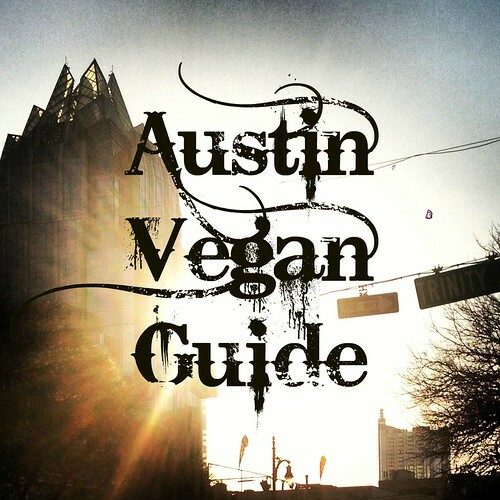 This entry was posted in Austin, Austin Guides and tagged #atxvegan, Austin, austin vegan restaurant, breakfast tacos, brunch, Food, lunch, tacos, vegan, vegan austin on April 28, 2015 by lazysmurf. 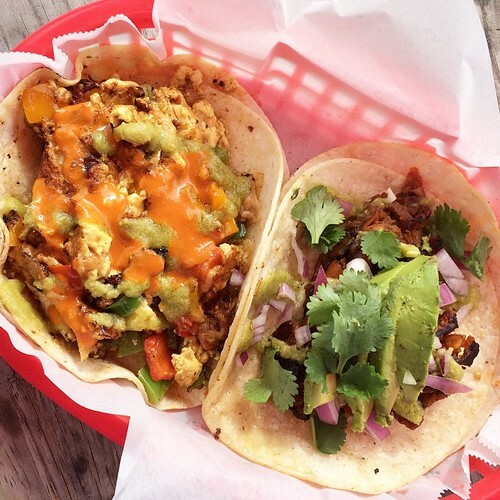 Where’s the Arlo’s on South Lamar? I’d love to have one in the neighborhood! It’s supposed to open at Radio Coffee any day now! It opened up over the weekend. Limited menu, but they say they’re adding the frier this week. What a great list! 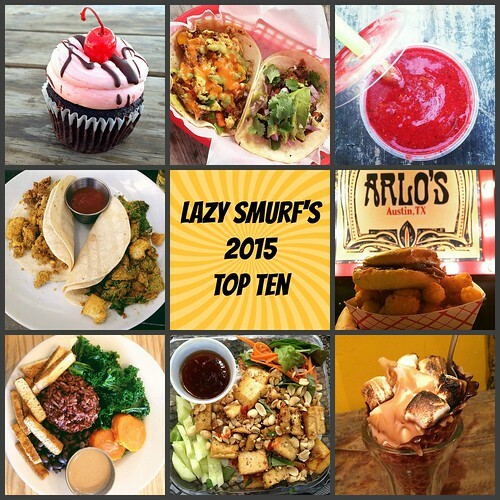 I think my top 10 would have all been mentioned here (including the last paragraph). I’m excited to have an Arlo’s down south. I am so excited to get to stuff all of this good food in my face in a month! Awesome list! I could happily live on Juiceland smoothies and Via 313 pizza. I’ve still never tried Lulu B’s…I live way north, north of the Steeping Room even, but I’ll have to make a special trip one of these days!